Beginning in colonial times, a quarantine system existed in New York Harbor to prevent foreign ships from bringing diseases into the port of New York. For much of the 18th century, Bedloe’s Island (today’s Liberty Island) was the quarantine station, where vessels having contagious diseases on board were required to stop and sick individuals were detained. In 1799, an act of the state legislature relocated the quarantine station to Staten Island; anchorage grounds and a hospital were established at Tompkinsville on the island’s northeastern shore. The quarantine remained at Tompkinsville for nearly 60 years, despite resentment by the island’s residents to its location there. Considered a blight on the community and an endangerment to its citizens, hostility towards the quarantine grew in the 1840s and 1850s when a surge in immigration brought an increase in patients at the complex. 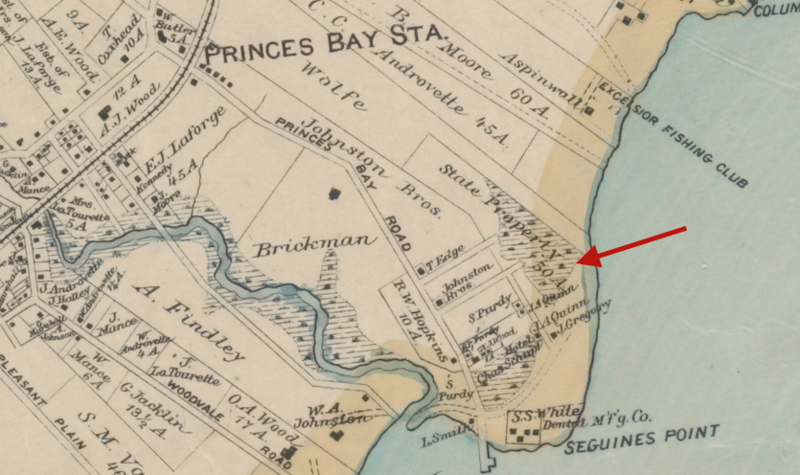 The state made several attempts to find another site for the quarantine, including acquiring property in 1857 at Seguine’s Point on the south shore of Staten Island where temporary quarantine buildings were erected. 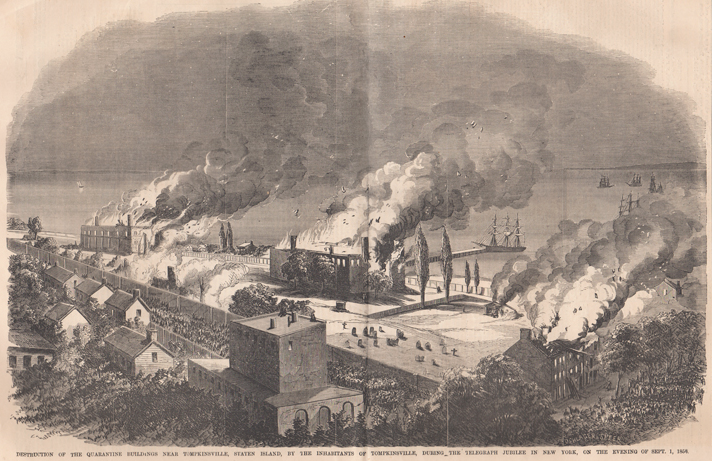 Authorities encountered the same animosity towards the quarantine here; in a series of attacks in May 1857, local residents burned down everything connected with the quarantine development at Seguine’s Point. With no other place to operate, the quarantine continued at Tompkinsville until September 1858, when it, too, was destroyed by locals who removed the patients from the buildings and torched the complex. Following the destruction of the Tompkinsville site, floating hospitals down New York Bay were used as an interim quarantine system pending construction of two artificial islands—Swinburne and Hoffman—in the Lower Bay off the southeastern shore of Staten Island. Swinburne and Hoffman Islands were used for quarantine purposes from the 1870s until the 1920s. During the quarantine process, physicians boarded ships upon arrival and inspected passengers and crew for signs of smallpox, yellow fever, cholera, typhus, or other pestilential diseases. Individuals determined to be ill were sent for treatment at the quarantine complex. In addition to treating those arriving from foreign shores, the quarantine hospitals also received patients from the city who showed symptoms of contagious diseases. 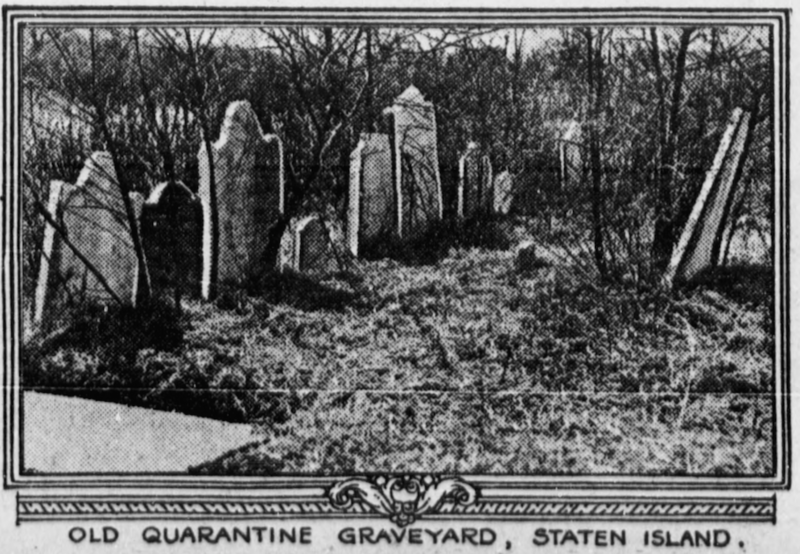 Patients who died in quarantine at Tompkinsville and subsequent facilities were interred in cemeteries on Staten Island that were part of the quarantine establishment. 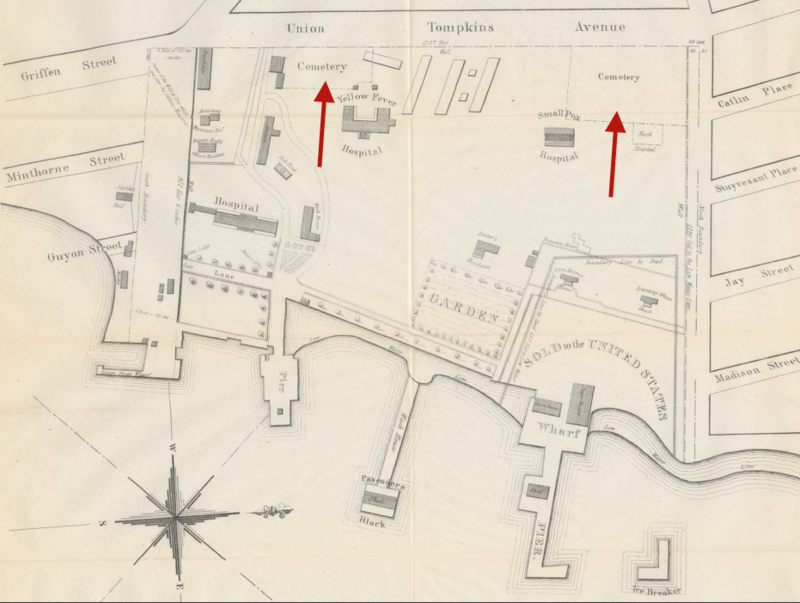 Approximately 10,000 individuals were buried—typically without ceremony or the presence of family or friends—in these quarantine cemeteries during the 19th century. Disposal of the dead who died in quarantine was a constant predicament for the establishment’s officials, as Staten Islanders opposed the interment of bodies of those dying of contagious diseases. In 1889 a crematory was erected on Swinburne Island to incinerate the remains of those who died in quarantine. Prior to the 1840s, the number of patients treated at the Quarantine was less than 500 per year; by 1849 the number had increased to 7,000 per year. New buildings were erected on the grounds to meet this emergency situation, but still the complex was crowded to overflowing. And with two or three patients dying each day, Quarantine officials were running out of space to put the bodies. Instead of burying the dead in single graves, as had been the previous practice, large trenches were dug in the northern cemetery where coffins could be stacked three deep. An estimated 3,000 burials were made in these mass graves during a two or three-year period and the decomposing bodies produced an offensive odor that was a major complaint to residents living near the Quarantine. 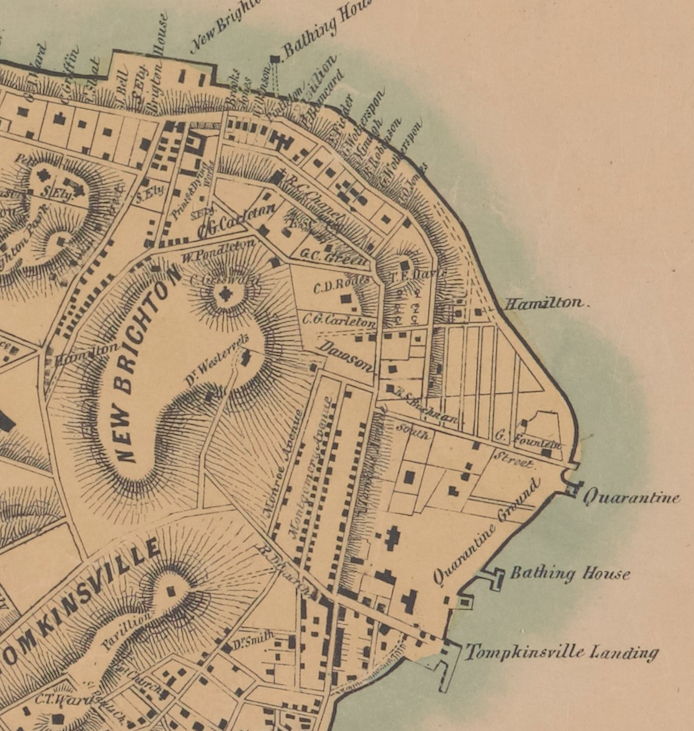 In 1849, the state legislature ordered the Quarantine to procure a new burial ground “remote from the premises of the Marine Hospital” and cease burials within its Tompkinsville site. Following the 1858 destruction of the Quarantine, the Tompkinsville complex largely lay idle until 1868 when it was sold to private developers who divided the property into buildings lots. 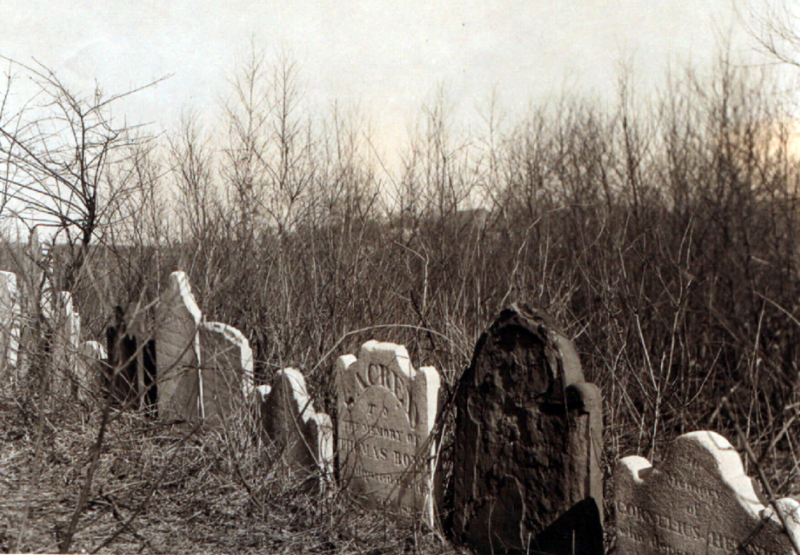 “Bodies with their accompanying gravestones” were reportedly removed at that time from the Quarantine grounds to the off-site cemetery that had been purchased in 1849 near Silver Lake; however, if remains really were removed, it’s likely only those from the older, southern cemetery were transferred. Recent archaeological investigations revealed that remains are still present at the site of the northern cemetery that was used in the late 1840s. In 2003, plans began for the construction of a new court complex on part of the former Tompkinsville Quarantine grounds, including the area of the northern cemetery. 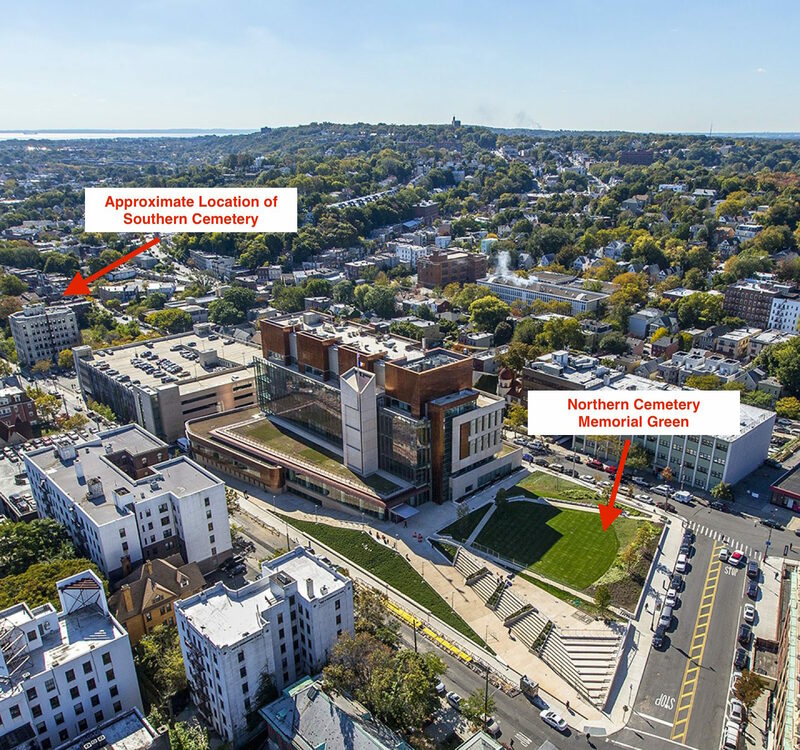 Archaeologists conducted exploratory tests along the perimeter of the cemetery site, which had been covered by a parking lot since the 1950s, and found human remains at several locations. The remains of 83 people were recovered from the site, including 38 intact burials, some still stacked two or three deep within the burial trenches. The rest of the one-acre burial ground site was left undisturbed and is now a Memorial Green in front of the St. George Staten Island Court complex; the human remains recovered from the site were reinterred here in 2014. 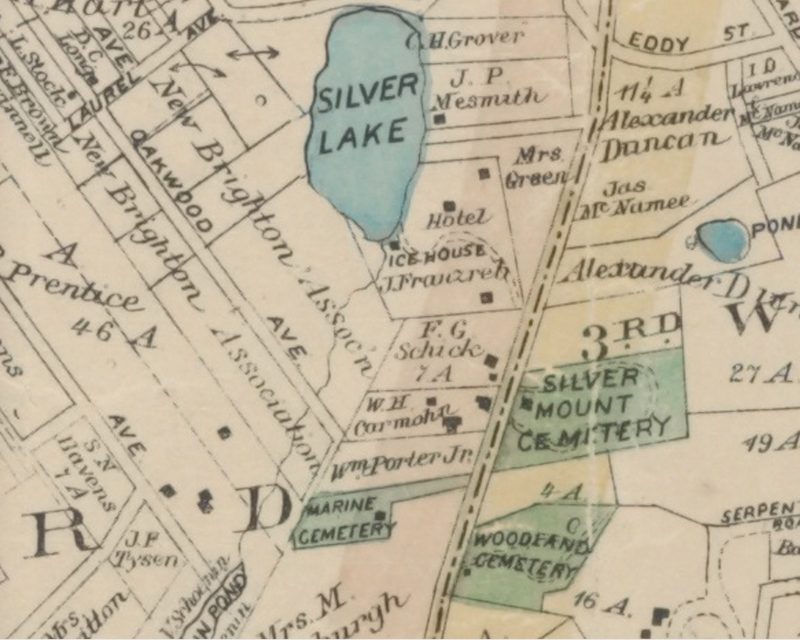 When Quarantine authorities were compelled to stop burying their dead within the Tompkinsville grounds in 1849, the state purchased four acres of land in the township of Castleton, near Silver Lake, for a new cemetery. 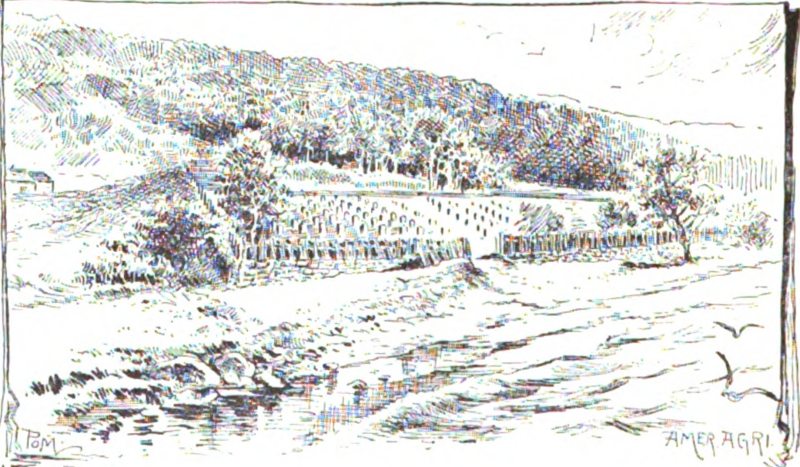 The burial ground, known as Marine Cemetery or Quarantine Burying Ground, was located on the northwest side of the Richmond Turnpike (today’s Victory Boulevard) and “situated as to be at the greatest possible distance from an inhabited neighborhood, and over forty rods [660 feet] from the nearest public road, yet not more than about a mile distant from the Marine Hospital.” A high fence, with well-secured gates, enclosed the grounds and a small house was erected in front of the enclosure for the permanent residence of the person in charge of the burial ground. Although the new cemetery satisfied the complaints of the inhabitants of the neighborhood of the Quarantine at Tompkinsville, it created a rift with the Town of Castleton, whose residents were alarmed to have the Quarantine dead transported by wagon through the village to the burial ground. The Castleton Board of Health made several attempts to prevent Quarantine authorities from sending bodies to the cemetery, but the state officials disregarded their prohibitions. Over 5,000 individuals were interred at the Marine Cemetery between 1849 and 1858. 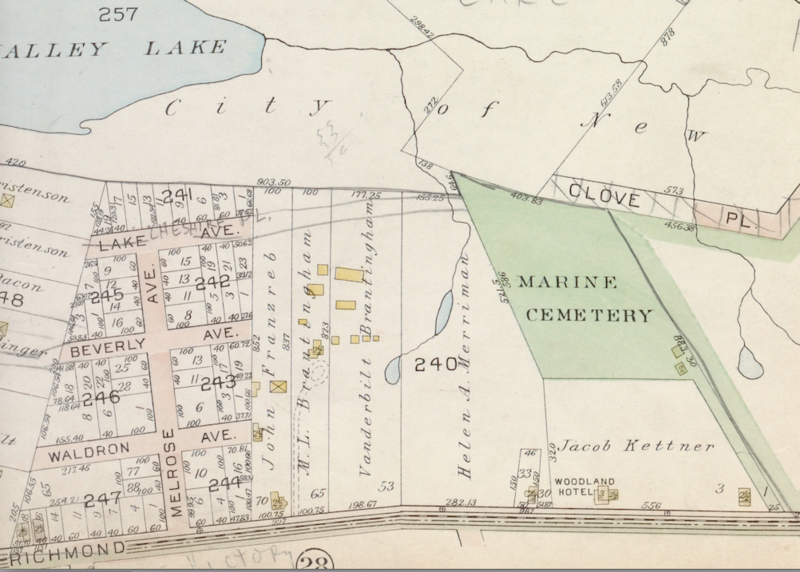 After the Quarantine was moved from Tompkinsville, the Marine Cemetery at Silver Lake became impractical owing to its great distance from the new quarantine facilities. The cemetery’s status is discussed in the 1869 annual report of the Commissioners of Quarantine, who note that although it could no longer be used for its intended purpose, “as it is the resting place of thousands who have fallen victims to disease while under quarantine, it should still be treated as a part of the establishment, and preserved from injury or depredations.” In 1924 the cemetery became part of the grounds of Silver Lake Park and is now within the park’s golf course. 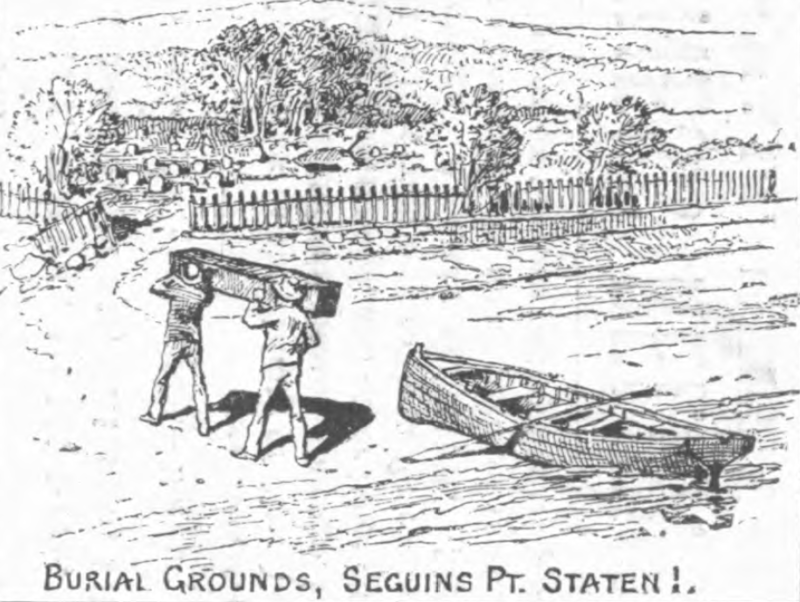 Once the Marine Cemetery at Silver Lake became useless for quarantine purposes after 1858, authorities turned to Seguine’s Point on the southeastern shore of Staten Island for a new burial ground. The state had purchased 50 acres here in 1857 with the intention of relocating the quarantine establishment to the property, but these plans were abandoned when locals torched everything built at the site. A portion of the property was reserved for burial purposes and was used for the interment of those dying in quarantine at the floating hospitals and later at the Swinburne Island hospital. Those dying of contagious diseases in the city or on vessels in the Bay were also buried here. The Seguine’s Point Quarantine Cemetery was described as an “isolated, lonely spot close by the water of the Bay, with a heavy body of timber intervening between it and the cultivated farm residences which dot this portion of Staten Island.” Enclosed by a picket fence and protected from the water by a small stone seawall, the graves were marked with wooden slabs identifying the deceased. There was no pier or landing place, and boatmen usually would run a small boat up on the beach and carry the plain, pine coffins the few yards up the shore to the cemetery. In 1867, the physician of the quarantine hospital ship described some of the difficulties in transporting bodies to the cemetery, which was eight or nine miles from their anchorage: “In stormy weather, especially when the wind is blowing on shore, the boat carrying the dead is immediately filled on striking the beach…The boatmen are thoroughly drenched, and have to remain so for hours, and are sometimes compelled to stay on the shore during the night, as the inhabitants in the neighborhood of the cemetery will not allow anybody from the hospital to come near their dwellings or even their outhouses.” The farmers and oystermen residing in the vicinity of the quarantine burial ground were sometimes driven “wild with rage” when they knew yellow fever and cholera victims were being interred in the cemetery. One boatman who was burying a body from the Swinburne Island hospital had to take to a tree to evade an angry party of neighbors who approached with guns and dogs to stop him. He escaped without injury but refused to bury another body at Seguine’s Point. A New York Times reporter visited the Seguine’s Point cemetery in 1882 and interviewed a man he found repairing his rowboat near the graveyard. “I once seen them bury a poor chap in that ground,” the man said. “They just hurried his coffin off a tugboat and dumped it into the grave. They didn’t have no prayers, but they just covered him up with dirt and left. Some summers they only bury six or seven there, but other summers they do a good deal more planting in that ground.” The remains of roughly 500 people were interred in the Seguine’s Point burial ground until 1889, when the quarantine establishment began to use the crematory on Swinburne Island to dispose of the dead. An act of Legislature of 1888 directed the removal of the dead at Seguine’s Point and the bodies “disposed of in such manner as will not endanger the public health.” The disinterment work—described in grisly detail in a series of articles in the New York Herald—was completed in February 1890. The bodies were incinerated in a temporary crematory constructed on the premises and the ashes gathered for reburial on Swinburne Island. The land that was once the Seguine’s Point Quarantine Cemetery is now part of Wolfe’s Pond Park.